Before baby comes home, it's important to prepare. 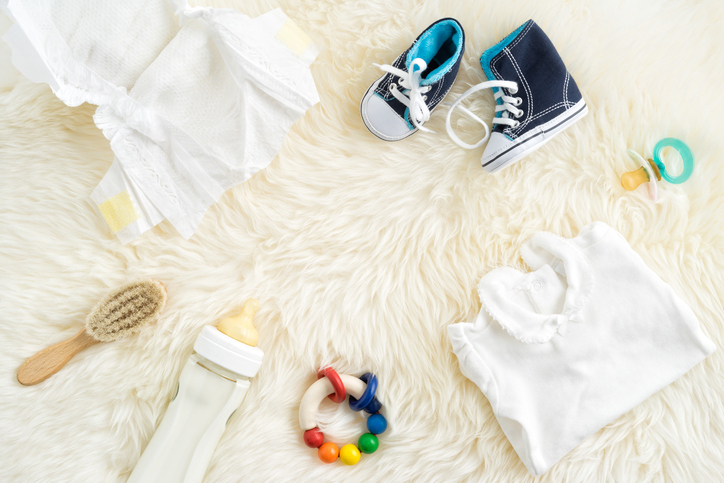 That doesn't just mean practicing bottle-holding and baby proofing your home; it also means stocking up on all the essential baby supplies every new parent needs. First things first: Your baby's going to be tired - being born is hard work! You'll need a good crib and some cute baby bedding. But you need to look out for more than just the right print and complementary colors. Baby bedding should be able to help regulate temperature while your little one is snoozing. Next up: feeding time. Make sure you have enough bottles, breast pumps, formula and burp clothes. Naturally, another priority should be diapers, baby wipes, diaper cream, changing pads and a diaper pail. These are essential baby products that every new parent absolutely needs ahead of time. Your little one won't want to lay inside all day long, so show your baby some fresh air. Start by getting the right stroller. It should be easy to maneuver, able to fit through most doors, light enough to lift by yourself and, ideally, foldable. With the perfect stroller at the ready, you'll be able to take your baby to the park to play - don't forget some outdoor toys, though! Bring a nice blanket for your and your little one to spread out on. Also, bring some toys like stackable cups, rattles and balls. Picking out baby gear can be fun, with loads of colors, shapes, styles and prints to choose from. It's important, though, to make sure you're choosing the best baby products to keep your little one clean, happy and safe.